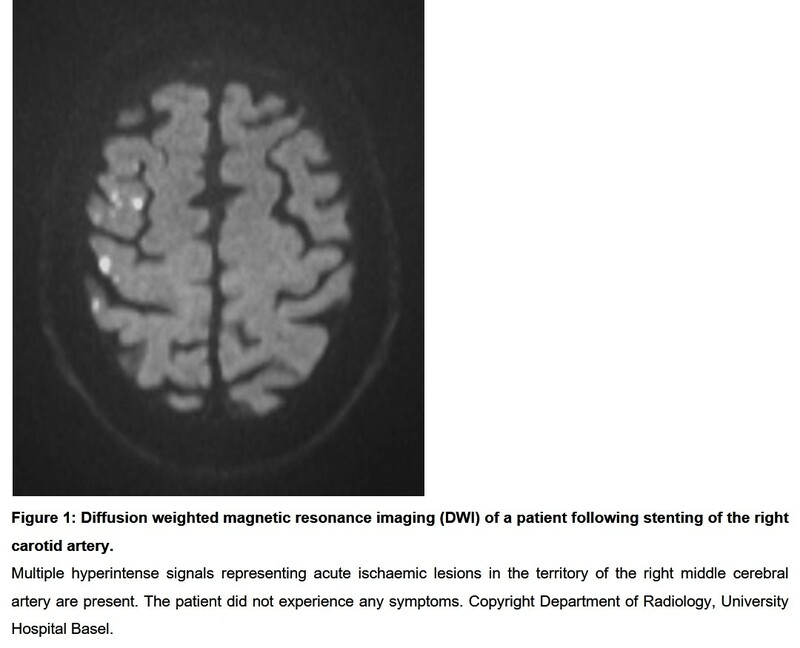 Aim To investigate whether lesions on diffusion-weighted imaging (DWI+) after carotid artery stenting (CAS) or endarterectomy (CEA) might provide a surrogate outcome measure for procedural stroke. Materials and Methods Systematic MedLine® database search with selection of all studies published up to the end of 2016 in which DWI scans were obtained before and within seven days after CAS or CEA. 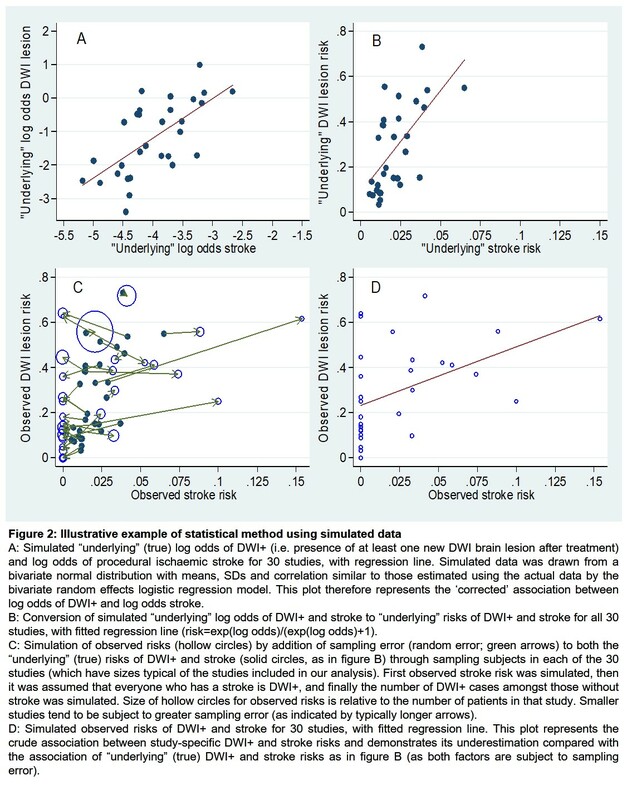 The correlation between the underlying log odds of stroke and of DWI+ across all treatment groups (i.e. CAS or CEA groups) from included studies was estimated using a bivariate random effects logistic regression model. 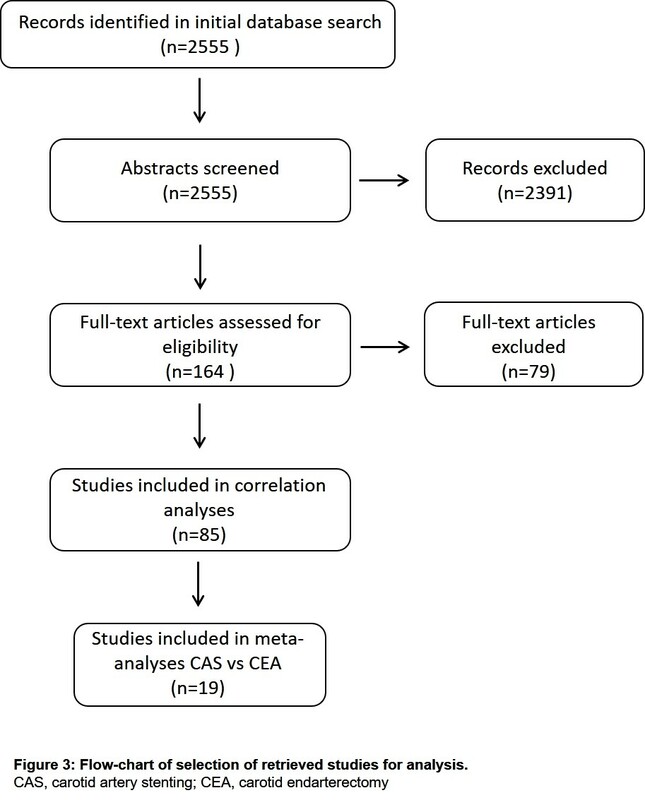 Relative risks of DWI+ and stroke in studies comparing CAS vs. CEA were estimated using fixed-effect Mantel-Haenszel models. Results We included data of 4871 CAS and 2099 CEA procedures (85 studies). Across all treatment groups (CAS and CEA), the log odds for DWI+ was significantly associated with the log odds for clinically manifest stroke (correlation coefficient 0.61 (95% CI 0.27 to 0.87), p = 0.0012). 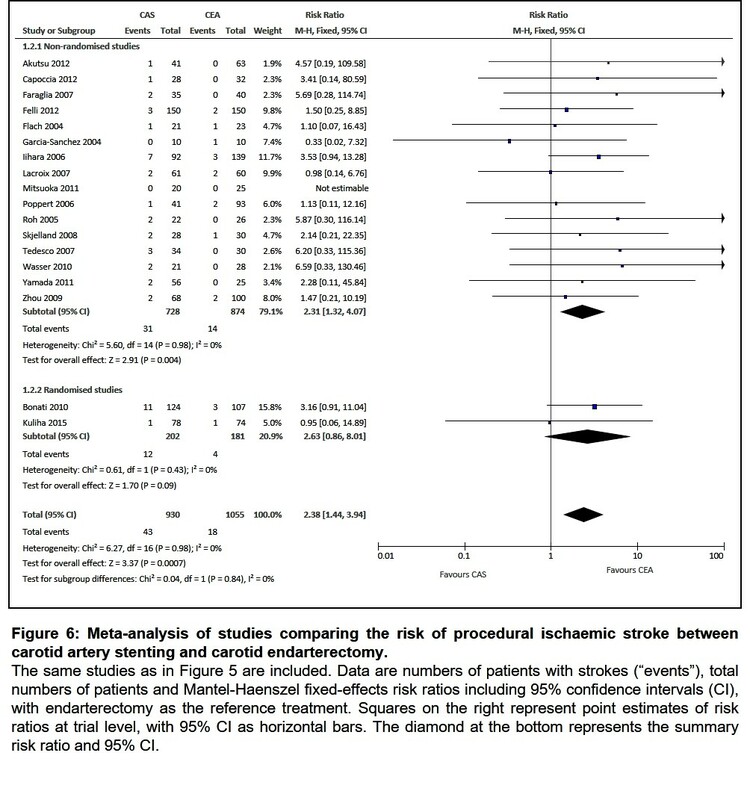 Across all carotid artery stenting groups, the correlation coefficient was 0.19 (p = 0.074). There were too few CEA groups to reliably estimate a correlation coefficient in this subset alone. In 19 studies comparing CAS vs. CEA, the relative risks (95% confidence intervals) of DWI+ and stroke were 3.83 (3.17–4.63, p < 0.00001) and 2.38 (1.44–3.94, p = 0.0007), respectively. 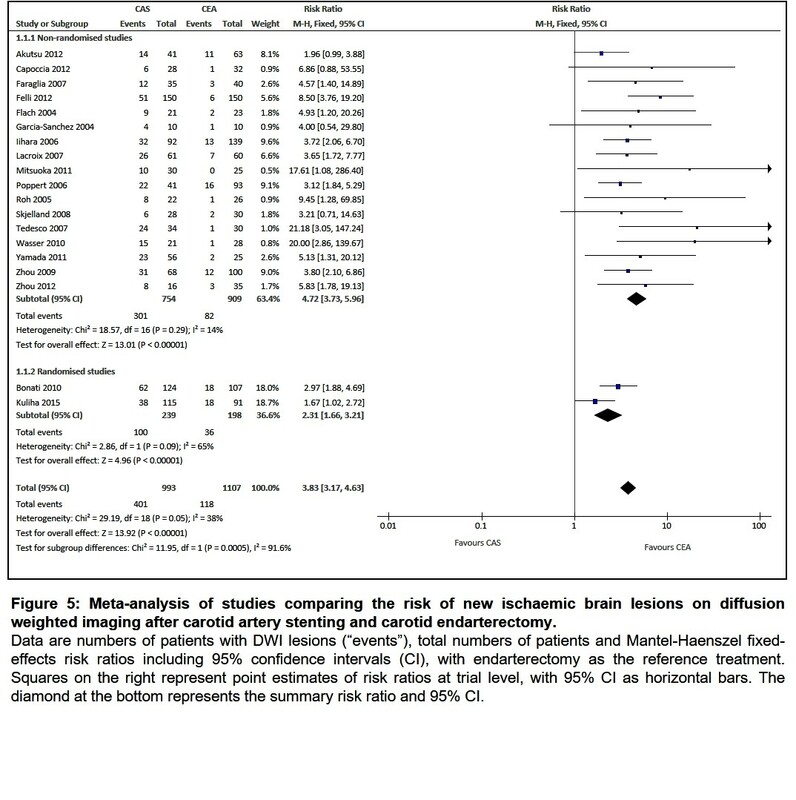 Discussion This systematic meta-analysis demonstrates a correlation between the occurrence of silent brain infarcts on diffusion-weighted imaging and the risk of clinically manifest stroke in carotid revascularisation procedures. 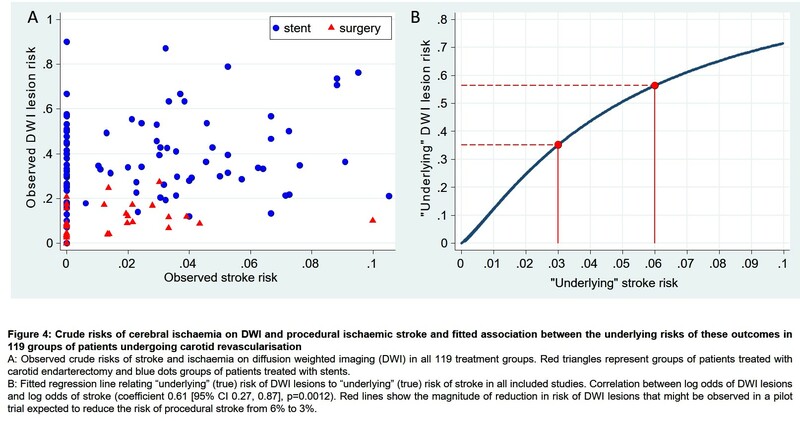 Conclusion Our findings strengthen the evidence base for the use of DWI as a surrogate outcome measure for procedural stroke in carotid revascularisation procedures. Further randomised studies comparing treatment effects on DWI lesions and clinical stroke are needed to fully establish surrogacy.